Rag bowls have been made since the beginning of time, it seems. They have found some form of bowls that are wrapped into a coil in many archeological digs, that go back for centuries. 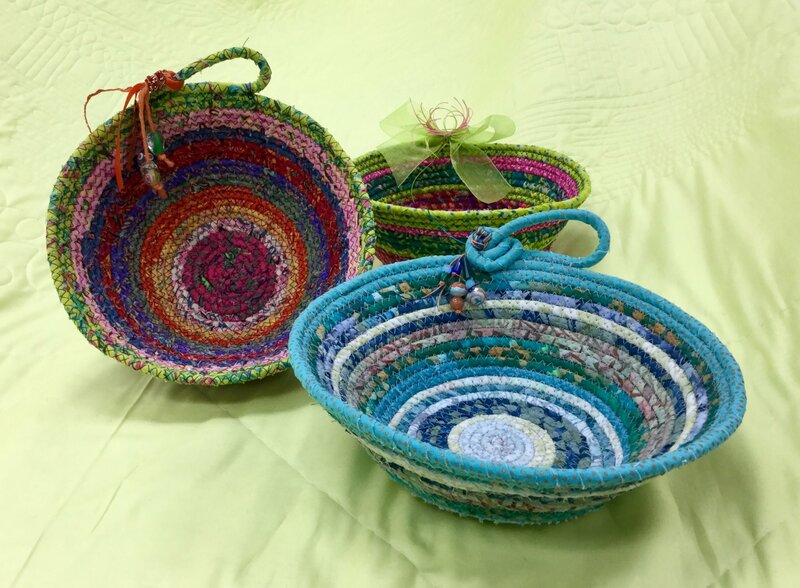 In more recent history, rag bowls were made in Appalachia along with rag rugs that were known to hold up over time. Rag bowls are sturdy, versatile and fun to make. This class will provide instructions for making a small bowl and hopefully have you leaving with your bowl and all you need to make more. Be careful - it is addictive, but if you are a quilter and/or sewing "nut", you know all about that!!! One very good thing is that it allows you to use up scraps of material that you might otherwise just have sitting around the house.